Action from the Armoy Road Races in 2016. The Armoy Motorcycle Road Racing Club is seeking a new title sponsor after SGS International brought an end to its two-year backing of the popular Irish road race, which takes place this year from July 28-29. Clerk of the Course, Bill Kennedy, said he was indebted to the company for its support as the search for a new headline sponsor for the 2017 meeting begins. “We would like to take this opportunity to say a heartfelt thank you to Brian McGrath and SGS International. 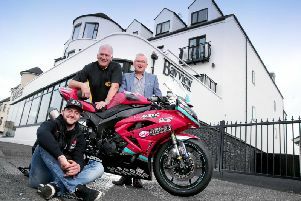 Brian’s support over the years has been unwavering and Armoy Road Races would not be in the position it is today without his and the company’s fantastic support,” said Kennedy. “We are now entering into our ninth year and the growth that has taken place over those years could not have happened without the valuable support and engagement from all our sponsors – we really are grateful to have the backing from many of our sponsors year on year. “Without sponsors, there are no Armoy Road Races. Regarding a new 2017 title sponsor, I would urge that if anyone is interested in sponsoring, supporting or engaging with us, I’ll be only too glad to talk to them,” he added. SGS International’s Brian McGrath said the Armoy meeting offered potential sponsors the chance to become involved with a race ‘unlike any other on the calendar’. “It has been a pleasure to work with the Armoy Road Races over the years. Bill and his team organise a fantastic race schedule and the atmosphere in Armoy is unlike any other on the road racing calendar,” he said.